This is the last in a six-part series. Sts. 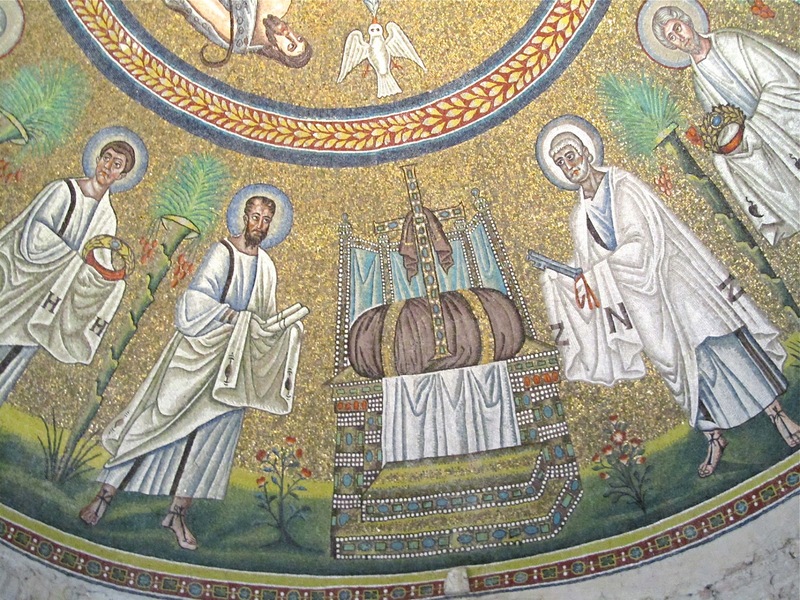 Peter and Paul and a throne prepared for Christ, Arian Baptistry, Ravenna, late 5th-early 6th centuries. What role then can the icon play in the Ecumenical Movement? Will it be an instrument leading to the healing of schisms or a sign of division? As with the hope of one day reaching the ultimate goal of ecumenism, so with the role of the icon in ecumenism: we cannot speak with certainty about one or the other. How is that possible? Well first of all, for Orthodox Christians, the icon is not only the visible proclamation of their faith today, but it is also the proclamation of the common faith that the Christian West and East announced together before the Great Schism between the Greek and Latin Churches. As we have said above, the two were united in the same faith during the first millennium, and the canonical iconography that the churches — the Church — produced together, in the West as in the East, despite the different local “styles,” made that unity of faith visible. From Ireland to Syria, from Kiev to North Africa, Christians proclaimed the same faith in words and images. So if the icon, which seems to deeply touch some Catholic and Protestant Christians, leads to a new appreciation of the time and conditions that permitted everyone to proclaim the same faith, and consequently, to celebrate the Eucharist together, we can only sing “Halleluiah.” If the rediscovery of these weird but fascinating images, called icons, leads to a rediscovery of our common roots, of our common faith, of our common theological understanding of the Scriptures, then there is hope, and the icon will have played a very great role. If we can all recover the conditions which allowed a council of union, 879-880, for the last time in history, to heal the schism between the West and the East , we may be able to rebuild the consensus of the first millennium and to annul, reverse, and neutralize the schisms we are living with today. If, on the other hand, the icon takes its place in the long series of styles, of which Vatican II spoke, each one succeeding the other; if, for Catholic and Protestant Christians, the icon represents nothing more than a sometimes beautiful, exotic, oriental, mystical image which will ultimately find its place among the others sorts of images — when the fad passes — without being appreciated for its theological importance, then I think a very important opportunity will have been lost. As long as the icon remains simply an object of personal piety according to the taste of some, but not necessarily of everyone, and as long as the icon does no find again its liturgical and dogmatic place in the churches, Christians will continue to paddle around going nowhere in their effort to rediscover the Camelot of former times: their lost unity, for apart from using icons as exotic decorations or objects of personal prayer, Catholic and Protestant Christians do not really know what to do with them. So, we come back to the title of this article, “The Icon: Sign of Unity or of Division?” According to the expression, “the jury is still out,” we cannot give a definitive answer, but we can work, hope, pray, and wait. See Johan Meijer, A Successful Council of Union: A Theological Analysis of the Photian Synod of 879‑880, Thessalonica, Patriarchal Institute for Patristic Studies, 1975.